I'd like to meet the person who looks up at an election poster and decides there and then - "I'm going to vote for the person on that poster". 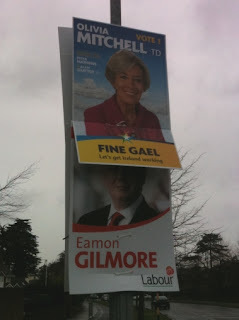 Marketing people tell us that that posters are very important - I recall from the last election in 2007 that some candidates were regarded as "having run a good poster campaign". 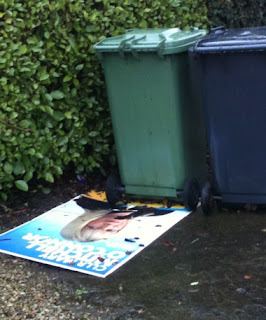 Getting your face familiar to the electorate is apparently vital, and election posters are supposedly a very effective way of doing this. I suppose this is especially true for new candidates. 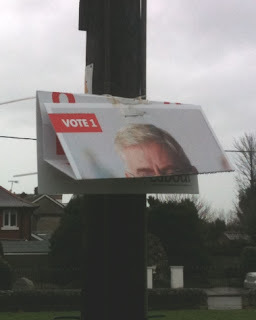 We have already seen the full portrait posters (mostly now blown away by the wind) - these will be followed in the days leading up to polling with those clever diamond shaped smaller signs with candidate and party names. 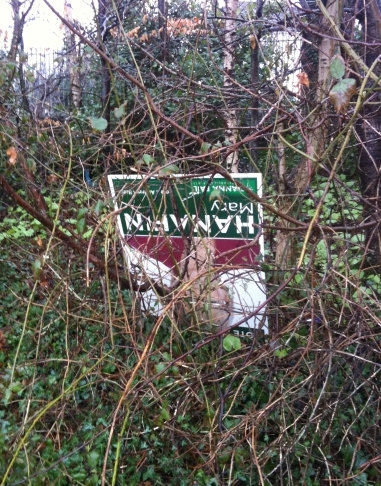 But do election posters work? 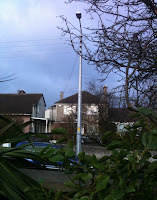 at the end of my garden. 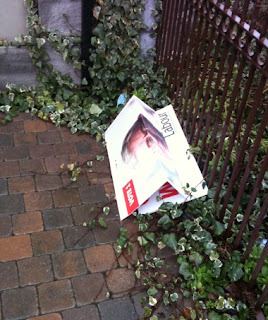 The wind has indeed taken its toll on posters and will no doubt have caused financial worries to all parties as they will have to be replaced. Printing companies must be very happy! Do the party volunteers not check the weather forecast? 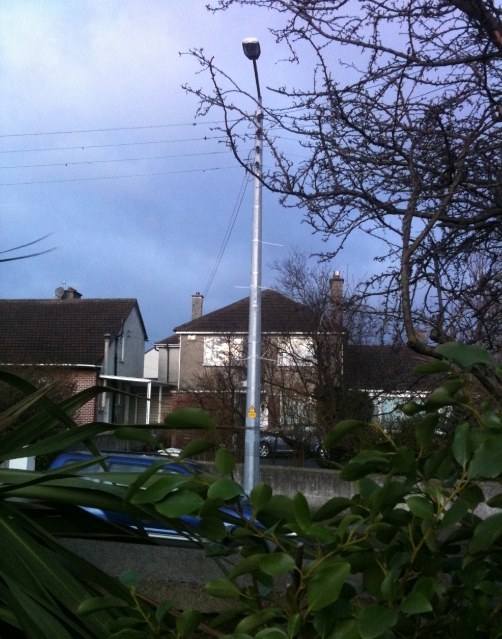 We now have the unsightly poster ties littering our lamp posts - now we have shiny new ones to go with the dirty old ones left over from the last election. I have ranted written about these poster ties before (here, and here). A message to all the political parties - please take down all the poster ties when you are replacing posters blown away by the wind? 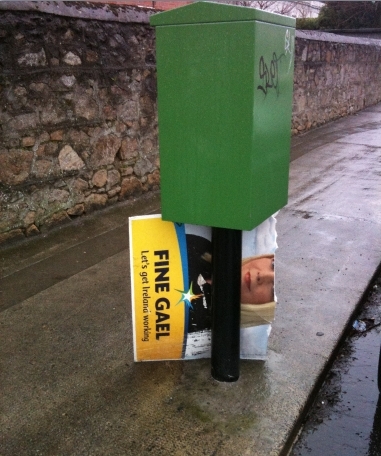 looking for the postal vote. shows us what she thinks of Eamon Gilmore. 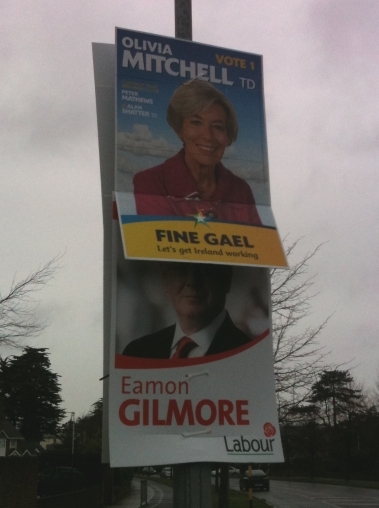 Not many votes down here Eamon!